Across the country in older homes, danger is lurking because of the “Grandfather Clause”. The simple definition is: “a part of a law which says that the law does not apply to certain people and things because of conditions that existed before the law was passed”. Although this may seem harmless enough and an inexpensive way to avoid costly electrical repairs, this clause is making certain that electrical danger still lurks in your home and is ready to strike when you least expect it. Most people have had the experience of smelling something burning, but never seem to find out what it is and simply go to bed or leave their home for the day. Unfortunately some of those people never wake up the next day due to an electrical fire. The most common Grandfather Clause is “Knob and Tube” wiring, which is over 100 years old and although not necessarily deemed a hazard, similar to asbestos, it is a severe hazard when disturbed during or after necessary electrical repairs are made. While the electrical wiring has not changed in over 100 years, the electrical demand in the home has changed considerably with the use of microwaves, dishwashers, garbage disposals and numerous electronic devices. This demand on aging wires and overloaded circuits are a recipe for disaster. 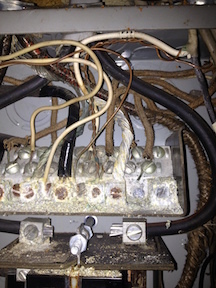 Due to the Grandfather Clause, the only time a homeowner is required to repair or replace knob and tube wiring is anywhere that the insulation is covering the wires and tapping onto it. Insulation in your attic is meant to be a fire retardant and have a slow burn rating, so why would it be a danger? Why would properly splicing (splicing wire is the process of joining two or more pieces of wire together. According to the National Electrical Code (NEC), wire splices must be contained in junction boxes, which are required to be covered and accessible in case you need to work on the wires in the future) knob and tube be a concern? Well, city code enforcement does not want this old wiring, but needs some kind of an “open door” to help keep you safe, but it’s simply not enough. Rewiring an older home is costly and could be a deal breaker in a lot of instances, but there needs to be more transparency into the liability of this wiring being faulty. If a home is located in a designated historic district, then preservation comes into play, although it doesn’t make you any safer. In many instances, these districts are located in more affluent areas with homeowners who can afford to make the upgrades to keep them safe. But we are not focusing on the people who can afford it. We are focusing on the people who have lived in these homes for many years and have grown old with the home, we are focusing on our Veterans, the economically challenged, and disabled homeowners in Michigan. There are many groups who fall victim to the “Grandfather Clause silent killer”, and we believe that advocating for change and repairing this aging electrical infrastructure is key to saving the lives and property of our target market. 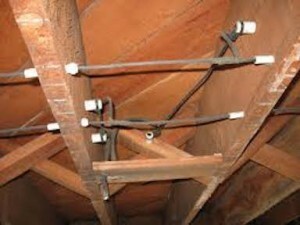 Grounded wires in the home didn’t become available until the mid 1960’s. Grounding provides an alternate path for electrical current to flow so it doesn’t flow through you. All homes run on AC wiring (alternating current). If you have ever seen any newer wires after you remove the sheathing or outer jacket, you usually find a black, white, and a ground wire. Alternating current means the current is flowing back and forth from the back wire to a device, like a plug or a light, and back through the neutral or white wire, and then back to the panel at light speed. The ground acts as sort of the drain during a fault (a fault or fault current is any abnormal electric current. For example, a short circuit is a fault in which current bypasses the normal load. An open-circuit fault occurs if a circuit is interrupted by some failure). Electricity looks for the path of least resistance and if it can’t go back to the electrical panel or a ground wire, then that path is you.Along with the wires in the walls of older houses that include knob and tube as well as all the other types of ungrounded wires, there is the problem of the circuit panel not being grounded. The National Electrical Code (NEC) requires two 8′ ground rods installed outside the electrical panel at least 6′ apart from one another to the ground bar inside the panel to assure if the ground in the house fails, there is another safety assurance. The other type of grounding as per electrical code inside the home is called bonding. This is a wire that attaches from the electrical panel continuously to the water meter, and attaching on both sides of the pipe leading into the meter and from the water meter. This is the first place where the bonding of the electrical panel to ground starts. Why the water meter? Because of how deep the steel pipes are in the ground. This provides the best grounding of the electrical service. Most of these panels are the round fuse type panels, and if you have ever tried changing them in the dark when the lights go out, you are not alone. Why are we explaining grounding? Because if all these precautions are to protect the electrical panel, then why aren’t they required to protect you? You can ground and bond your panel according to code and the Grandfather Clause looks the other way, but what do you need to be safe? Pictured below is a panel filled with oxidation. 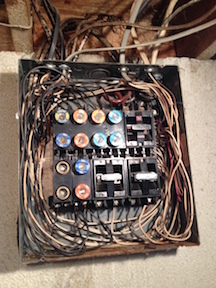 Code requires that all the neutral wires must be separated in the panel to avoid oxidation. This occurs when the demand on the wire increases, causing the wire to heat up, and when the demand decreases, the wire cools off. This causes expansion and retraction of the wires, and over time that neutral wire may work its way out of the lug in the panel, and this is when arcing (an arc occurs when electric current flows between two or more separated energized conducting surfaces. Some arcs are caused by human error including dropped tools, accidental contact with electrical systems, and improper work procedures. Another common cause of an arc is insulation failure) occurs and causes a fire. Oxidation is a natural occurrence with electrical conductors, but with proper deoxidizing products and keeping all current-carrying conductors separate, there is less chance for dangerous temperature changes from multiple circuit’s neutrals and oxidation to occur. 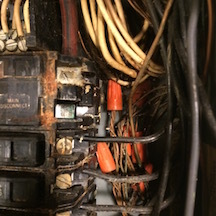 Many of these circuit panels were built when there were no grounding requirements, so the electrician, homeowner, or handyman simply put a wire where it was not meant to be and unknowingly put the homeowner at risk for fire. Aging service entrance cable feeding the panel from the outside of the home deteriorates over time and condensation leaks right through the cable and into the electrical panel, and causes oxidation as well. Electrical and water do not mix. Replacing the electrical service completely, and following the proper electrical codes, is the only way to prevent disaster. Sure many of us know a good guy who charges very little and fixes your gutters or paints a bedroom. Unfortunately too many times you may get a handy painter who says “hey I can replace these plugs to match the paint”. STOP! Look at who you hired to do what job and say to yourself, “there is nothing cosmetic” about electrical. Be aware that there are some projects a handyman may not be licensed to do; specialized trades, such as electrical work, require licensing. Please do not take the risk of trusting someone unlicensed with your property and the life of you and your family. There are three things you need from an electrician when making sure you are safe when having electrical work done: LICENSED, INSURED, AND BONDED. When you see a handyman and his van says licensed, insured, and bonded, be wary. FIRST, If you are licensed to do electrical work, then you are an electrical contractor. Why would you be a handyman if you held an electrical contractor’s license? SECOND, anyone can get insurance to protect them from a lawsuit so they don’t get sued personally, but that insurance will never cover an electrical fire, as the homeowner knowingly hired an unlicensed person to do electrical work, and unfortunately wouldn’t be covered. THIRD, bonded. Bonding is an assurance that the job will get done or there are penalty clauses, it also insures that manpower payroll will get paid. This is not something everyone carries because every job is different and the cost of the work determines the size of the bond needed, and you as the homeowner are the only one hiring them to do this job. Generally, bonds are required through municipal jobs or larger projects. There are great handymen out there, but never hire them to do anything that will endanger your property or your life. A licensed professional will costs more money but aside from the law, it’s better in the long run for peace of mind. Also, many times handymen or unlicensed electricians will ask you to pull a homeowner’s permit, RUN!!! They do this to avoid liability and if something goes wrong, they can simply walk away and many times with your money. Lastly, beware of the so-called electrical contractor that has his buddy pull a permit. Make sure his name is on the permit and ask to see a copy of his license on the spot. Electricians and contractors, including apprentices, are required by law to carry a license at all times. Inspectors who catch these electricians will make examples of them and charge you with stiff fines. Go to www.michigan/gov and click license look up to see if the person you hire is what he says he is. Electrical safety is our number one priority and our organization is dedicated to public safety.